It is just before dawn in the Strait of Hormuz. Through the pale mist, the mountains of Oman show up as shadowed silhouettes. Stars still light the sky above, while diamond sprays of water droplets fly off the brow of the Silver Whisper. In the peace of the sea, the only sounds come from the wooden boats hugging the Iranian coast and the dolphin shoals that abound the waters. This is a great way to travel. We fly to Dubai on a Jet Airways flight and, minutes later, are at the cruise terminal. The first few hours on the ship are a joy, spent discovering this magnificent palace on the sea that will be home for 10 days. We wander through the open decks, past the pool, the shops, the casino (shut at ports) and vast gourmet restaurants. The suite is stocked with champagne and chocolates each day. Fresh flowers and Bulgari toiletries add to the glamour. Though sailors advise a suite mid-ship, as it makes for a smoother ride in rough weather, that is a non-issue on this cruise where the Arabian Sea is like a sheet of glass. After a heady Captain’s Welcome Party, where everyone looks as if they were dressed on The Poseidon Adventure film set, we dock early morning at our first port of call: Khasab. Often called the Norway of the East, Oman’s Musandam region—of which Khasab is the capital—must be one of the last untouched areas on earth, with rugged mountains leading into a sea so clear we can spot fish as if in an aquarium. We take a dhow to Telegraph Island (from where a submarine cable carried telegraphy once all the way to Mumbai), while some others opt for a safari to Harim mountain. We sail out into the sunset, after an Omani song and dance troupe waves us goodbye. The wonderful thing about cruises is that you sleep in one city and wake up in another. And so we find ourselves at Fujairah, in the UAE, the next morning. A vast port city with not much to do except a dune drive or a trip to the Ras al Khaimah mountains, where the landscape seems straight out of the Bible. You feel Charlton Heston will appear any moment from behind a rock with the Ten Commandments. 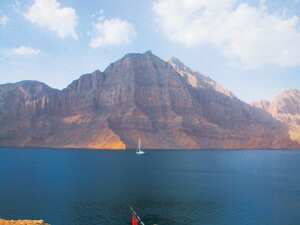 If the modernity of Dubai and the dramatic landscape of Musandam leave you asking for more, Muscat certainly delivers it. Nestled in the mountains, in a cove where the sea is as blue as tanzanite, Muscat must be the most precious treasure in all of the Persian Gulf. The bustling bazaar is a veritable Alladin’s cave of delights. I purchase a 17th century Arabic mariner’s astrolabe, mapping the stars in turquoise stones studded in antique brass. I also splurge on silver headwear worn by women from the Dhofari tribes. These are serious museum pieces. To best enjoy Oman’s capital city, walk. In the old walled city, sand-coloured homes are stacked like toys. At the centre is the fabulous palace of the Sultan of Oman. At one time, he controlled all the waters from here till Africa and, in the 16th-18th centuries, the slave trade as well. It was from these regions that the Magi, the three wise men, carried gold, frankincense and myrrh to baby Jesus. Frankincense has a sweet but musky aroma that is quite unique and it’s an absolute must-buy in Muscat. The departure from Muscat is as dramatic as the arrival. As the Silver Whisper pulls out of the port, the sun sinks over the mountains and turns the sea into gold. The stars twinkle over this magical city as we bid an almost tearful farewell. After Muscat, we spend three days at sea: time to enjoy the ship, the crew, the passengers and the epicurean delights. Over the 10 days, the tables groan under 70kg of smoked salmon, 90kg of lobster tail, 180kg of cheese, 450kg of butter, 30kg of foie gras and 6kg of caviar. As for the wine and bar stock, let’s just stay it was premium all the way. 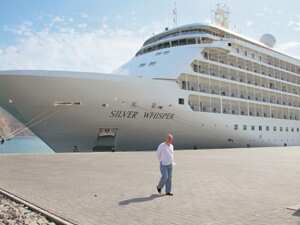 The best part of Silversea Cruises (www.silversea.com), the high-end line that operates Silver Whisper, is their all-inclusive rate. There were no hidden extras, no tips and no bills (even for private parties you may wish to host on board). When we reach Mumbai, I throw a party for 30 and it’s a blast. The perfect gift to yourself is a cruise that begins in a foreign land and brings you home in the best style possible. Wendell Rodricks is a Goa-based fashion designer.